Katelin Akens - missing since 5 December 2015. Possible serial killer link? Thread: Katelin Akens - missing since 5 December 2015. Possible serial killer link? Luggage belonging to Katelin Akens, a 19-year-old woman who disappeared en route to a Virginia airport, has been found in a Spotsylvania County drainage ditch. The discovery was made one day after another young woman turned up dead, heightening concerns for Akens' safety. "The circumstances surrounding this case are suspicious enough to warrant our full investigative efforts, in attempting to locate Miss Akens," Spotsylvania County Sheriff Roger L. Harris said in a statement to WSUA News. According to the sheriff's office, a family member was taking Akens to the Ronald Reagan National Airport on Saturday when the teen asked to be dropped off at the Springfield Mall. She reportedly planned to take the Franconia-Springfield metro from the mall to the airport. For reasons unclear, Akens never boarded her flight from Virginia to Arizona, where she was to attend cosmetology school. Investigators are still trying to determine if she made it to the metro or to the airport. The first big break in the case came on Monday when authorities discovered Akens' luggage discarded in a drainage ditch in Spotsylvania County near the Fredericksburg city limit. The teen's wallet, identification, credit cards and plane ticket were reportedly among the items found in the luggage. "It's scary," Akens' mother, Lisa Sullivan, told WRIC News. "You don?t know what to think. Where is she?" The discovery of Akens' suitcase came a day after police found the body of 21-year-old Heather Ciccone slumped over the steering wheel of a vehicle parked outside a Spotsylvania residence. The Free Lance-Star reported Ciccone died as a result of a gunshot wound to the head. Detectives have yet to name a suspect or person of interest. As of Tuesday, there is no indication Ciccone's death is connected to Akens' disappearance. However, both cases have area residents on edge. "It sounds as if there may be yet another serial killer in Spotsylvania County," one local posted on Facebook Tuesday. The post was likely a reference to Richard Marc Evonitz. A career criminal, Evonitz committed suicide in 2002, after police sought him out for questioning in connection with a number of crimes, including the deaths of three girls in Spotsylvania County. Never have I been a blue, calm sea...I have always been a storm. Amber told me that when Katelin told her that her step-father James was going to be the one taking her to the airport, because of his history with Katelin she felt concerned and she REALLY didn't want him to be the one to take her. So, she told Katelin that she could ask one of her family members who live nearby to take her to the airport instead. Katelin then told her that someone else (a trusted family friend) was going to be taking her.... but for some reason, that never happened. Her mom dropped her off at James's house in Partlow so he could take her. Correction...those comments were posted by Katelin's girlfriend. There have been new developments in the case of 19-year-old Katelin Akens, who went missing out of Spotsylvania last weekend. Lisa Sullivan, Katelin’s mother, says she dropped her daughter off at her stepdad’s home in Spotsylvania County on Saturday so he could take her to the airport to catch a flight to Arizona. Sullivan said the teen’s stepdad told her that Akens decided she wanted to go to Springfield Town Center first. She then planned to take the Franconia-Springfield metro to Reagan National Airport. According to Captain Jeff Pearce with the Spotsylvania County Sheriff’s Office, authorities have been able to corroborate that Akens’ stepfather’s car was in the area of the mall that day, though there is no surveillance video of Katelin or her stepdad at Springfield Town Center. Captain Pearce says cameras were not covering the area of the mall that the stepfather says he left Katelin. He would not elaborate on how investigators confirmed the car was there. Right now, police cannot confirm whether Katelin was at the mall or if she even left Spotsylvania. Authorities have also not yet said that the stepfather himself was at the mall, just that his car was in the area. Akens’ stepfather is still being interviewed by police. He has not been called a suspect or person of interest in the case. On Monday, Akens’ luggage was discovered abandoned in a drainage ditch on River Road in Spotsylvania County near the Fredericksburg city limit. “Her phone charger, her wallet, it still had her ID, her credit cards, cash, her old glasses and her old plane ticket,” said Katelin’s sister, Gabrielle Akens. 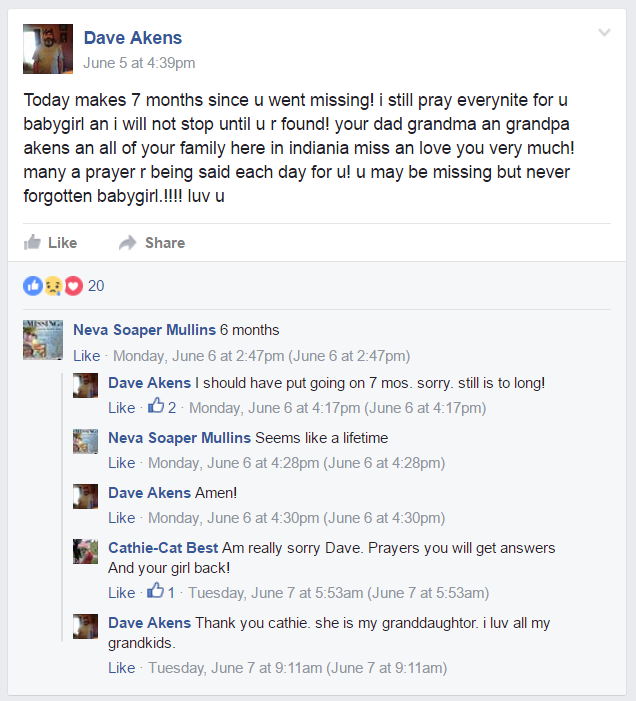 Akens’ family tells 8News that her cell phone goes straight to voice mail when they call it. “It’s very unusual. She texts me millions of times a day, calls us. It’s unusual for her not to text us,” said Gabrielle Akens. Captain Pearce calls her disappearance suspicious. Anyone with information that can help detectives in this case is asked to called the Spotsylvania County Sheriff’s Office at 540-582-7115. The search for Katelin Akens has produced some new leads, but authorities in Spotsylvania County, Virginia, are not clarifying on what those leads are. WUSA 9 News reports that evidence has been obtained from luggage belonging to the woman, which was found abandoned in a drainage ditch. What happened to this missing woman, and are authorities close to finding her? When Katelin Akens was last seen, she was being dropped off by her stepfather at a Metro station, where she was supposed to travel to the airport to catch a flight to Arizona. However, she never made that flight, and hasn’t been seen or heard from since her stepfather reportedly dropped her off. A text was reportedly sent from her phone after she was dropped off, indicating that she was at the airport to board her flight. However, it’s not known if she is actually the person to send the text, or if someone else sent it from her phone. Currently, investigators are working on finding where the text was sent from, geographically, to determine whether or not it is evidence behind what happened to her. The fact that the missing woman’s stepfather was last to see and talk to her has sparked some speculation on social media and crime case forums like Websleuths. However, authorities have confirmed that Katelin Akens’ stepfather is not a person of interest or a suspect in her disappearance. Furthermore, authorities have stated that surveillance footage obtained from cameras in the area where she was dropped off has corroborated with the statements given by her stepfather. More speculation surrounding the disappearance of Katelin Akens surrounds the murder of Spotsylvania woman Heather Ciccone, who was found shot dead in her own car on Monday morning. When Katelin Akens was last seen, she was being dropped off by her stepfather at a Metro station, where she was supposed to travel to the airport to catch a flight to Arizona. However, she never made that flight, and hasn’t been seen or heard from since her stepfather reportedly dropped her off. A text was reportedly sent from her phone after she was dropped off, indicating that she was at the airport to board her flight. However, it’s not known if she is actually the person to send the text, or if someone else sent it from her phone. Currently, investigators are working on finding where the text was sent from, geographically, to determine whether or not it is evidence behind what happened to her. The fact that the missing woman’s stepfather was last to see and talk to her has sparked some speculation on social media and crime case forums like Websleuths. However, authorities have confirmed that Katelin Akens’ stepfather is not a person of interest or a suspect in her disappearance. Furthermore, authorities have stated that surveillance footage obtained from cameras in the area where she was dropped off has corroborated with the statements given by her stepfather. More speculation surrounding the disappearance of Katelin Akens surrounds the murder of Spotsylvania woman Heather Ciccone, who was found shot dead in her own car on Monday morning. The Huffington Post reports that locals in the area are on edge, with some people commenting that there may be a serial killer in the area, preying on young pretty women. The suspicious circumstances and timeline of the two cases have led some people to speculate that they could be related. However, authorities have confirmed through multiple reports that the disappearance of Katelin Akens and the murder of Heather Ciccone are in no way connected to one another. Even though authorities have declared no known connections between Katelin’s and Heather’s cases, residents do have reason to be uneasy. The area has been home to at least one serial killer, including Richard Marc Evonitz, who was accused of killing three different girls in Spotsylvania County, Virginia. The man eventually committed suicide in 2002. The state of Virginia is no stranger to serial killer activity, in general, with such notorious names as the Briley Brothers, Timothy Wilson Spencer, and the elusive Colonial Parkway Killer on the list. However, none of these examples mean, in any way, that either of these Virginia girls are victims of a career predator. Katelin Akens is 19-years-old, standing at 5’4″ and about 129 lbs. She has blonde hair, blue eyes and multiple tattoos. If you know anything about this missing woman’s disappearance, you are encouraged to call the Spotsylvania County Sheriff’s Office. As for the evidence reportedly found in her luggage, authorities are not clarifying on what was found, nor are they sharing any information about the leads they are currently investigating. Apparently Katelin was in he same county as Heather Ciccone who was found shot. On Monday, authorities found luggage belonging to Akens strewn in a drainage ditch just outside Fredericksburg. Sorry I can't cut and paste right now. Its a post from her gf basically saying she found something out about Katelin that changes things and she is moving on. SPOTSYLVANIA COUNTY, Va. (WRIC) — There have been new developments in the case of 19-year-old Katelin Akens, who went missing out of Spotsylvania last weekend. Not according to Find Katelin page unfortunately. I never heard them reveal where the text was sent from. Sullivan said Akens then planned to take the Franconia-Springfield metro to the airport, and had texted her later that day saying she had arrived at Reagan International. Investigators are reviewing surveillance video from outside the mall and authorities have subpoenaed records from her cell provider to determine where her last text was sent from. It looks like the dump site was off the highway on a direct path back to where she started. Not much new, but it looks like they have decided that she definitely didn't go anywhere. It has been one year since Spotsylvania teen Katelin Michelle Akens disappeared. Katelin was last seen on Saturday, Dec. 5, 2015, when her mother, Lisa Sullivan, dropped her off at her stepdad’s house in the 200 block of Oak Crest Drive in Partlow. He took her to the Franconia-Springfield Metro station to catch a train to Reagan International so she could fly back to Arizona, where she was living, and was getting ready to start cosmetology school. The mother says she got a text message saying Katelin had boarded the plane; it turns out, however, she never boarded the plane. Virginia Department of Transportation employees were working along River Road in Spotsylvania on Monday, Dec. 7, 2015, and discovered luggage down in a drainage ditch that belonged to the missing girl. Missing from the luggage were some clothes, some cash and her cell phone, which hasn't been turned on since she went missing. What investigators and the family say is strange is that other important items were left behind like her bank card. Katelin is described as a white female, 5'4" tall, 122 pounds, with blonde hair and blue eyes. Anyone with any information on her disappearance can call police at (800) 928-5822 or (540) 582-5822. For my weekly Disappeared episode update, this week is was Katelin's turn. Her stepfather is SOOOOOOOO shady. Damn, they've already pulled the video due to copyright stuff. Still works for me. May be a country viewing issue. Her stepfather is SOOOOOOOO shady. Just watched this. and yes! I think the cheating and her not wanting to go back home and her going missing are 2 completely different things. If nothing happened where she cheated, I think her stepdad still would have killed her...err I mean, she would still be missing. Because they are probably not ghetto and hood like me. Investigators are still looking for answers two years after 19-year-old Katelin Akens went missing from her ex-stepfather's home in Spotsylvania County, Virginia. Her disappearance is a haunting case that's left investigators deeply puzzled. Detectives Rob Marshall and Sharon Williams have done seemingly everything they can think of to solve the case. "We have worked with what three psychics? We are not going to turn down any information," says Detective Williams. The two say they are constantly thinking about the investigation, wondering what they may have missed. Both of them have been puzzled over two text messages sent from the teen's phone the day she disappeared. "I'm staying with a friend." "I need some time alone." Police believe they were sent from the tower in Stafford County. No one in the investigation and certainly not anyone in Katelin's family thinks she was the one who typed those messages. The last time Katelin was seen alive was at Branton's home. Spotsylvania police have been interested in Branton. They say he has not been truthful about where he took Katelin the day she disappeared. He has refused to take a polygraph test and has declined to turn over the password to his encrypted cell phone. FOX 5 attempted to reach James Branton to get his side of the story, leaving a note in his mailbox and calling him on the phone. Detectives say they have not spoken to Branton two years. "No, he has nothing to do with us," says Detective Marshall. Investigators searched his home, taking a variety of guns, electronics and Branton's DNA, but there was nothing that would lead them to Katelin. As the days and months go by with no sign of Katelin, Sullivan and her family have marked special occasions by releasing balloons into the air. At the same time, she has kept the pressure on Branton. She recently left a letter at his home. "Do you care at all? You are acting like a coward. I trusted you James. Why didn't you just drop Katelin off at the airport?" "He has done nothing, he hasn't even gone to anything we have done for her," says Sullivan. "Hasn't shown up for nothing." Despite the ominous signs Katelin may have met foul play, Sullivan still holds out hope her daughter is still alive.